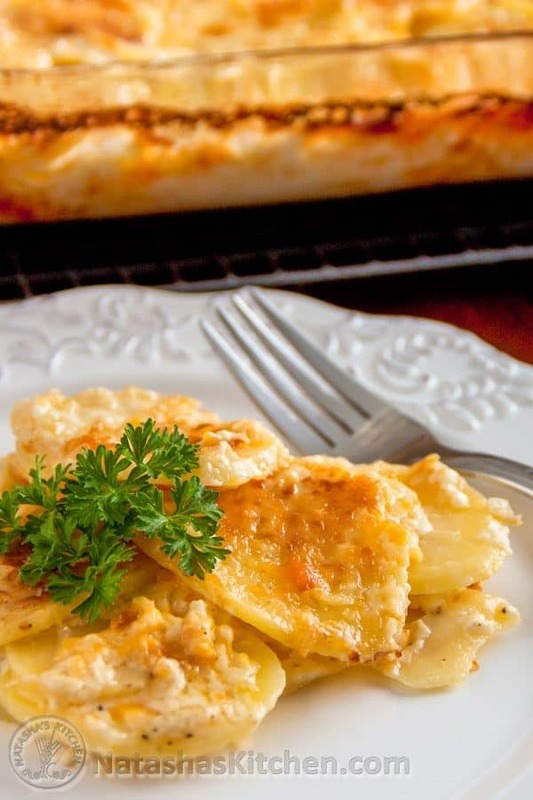 These Scalloped potatoes are rich and wonderful. 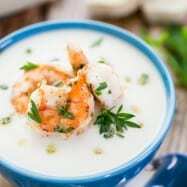 You’d probably earn 10,000 points with weight watchers, but it’s a very nice dish for special occasions. Oh and we are continuing our countdown to Christmas so read on to find out what I’m giving away! 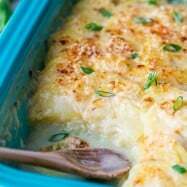 Preheat Oven to 375˚ and butter a 9×13 glass baking dish. 1. 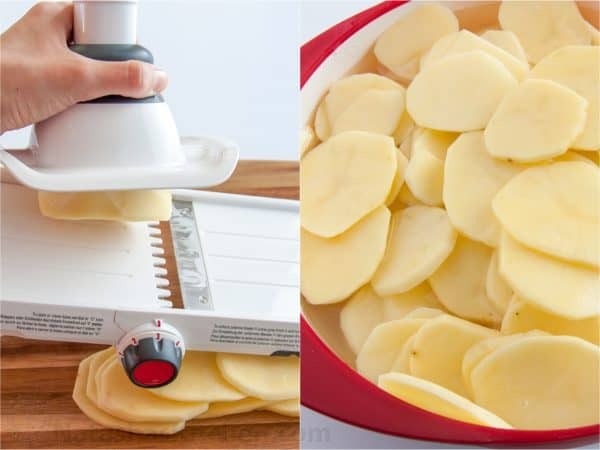 Using a mandolin, carefully slice the potatoes into rounds that are about 1/8 inch thick. Place slices into a large bowl filled with water. Mandolin… ahem…hint, hint. 2. Sautee 4 Tbsp butter with 1/2 medium chopped onion in a medium saucepan about 5 minutes or until onions are soft. Add pressed garlic and stir an additional 1 minute. Stir in 2 cups heavy whipping cream and 1 cup whole milk. Heat to a simmer then pour over potatoes once they are in the baking dish (after step 4). 3. Drain potatoes and pat dry with paper towels. Layer half of the potatoes into the baking dish. 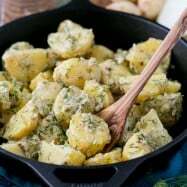 Combine the salt and pepper and sprinkle half of the salt and pepper mixture on top of the potatoes. Sprinkle 1.5 cups of cheese on top of the potatoes. Repeat with the the other half of the potatoes, salt and pepper and cheese. 4. 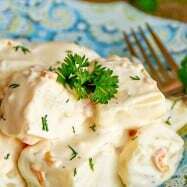 Pour the cream over the potatoes and push the potatoes down to submerge them into the cream. They won’t be fully covered by cream and that’s ok. Cover dish with foil and bake on the middle rack of the oven for 1 hour. Then remove foil and bake for another 30-45 minutes until top is golden and bubbly and most of the liquid has been absorbed by the potatoes. If the potatoes are browning too fast, tent dish with foil and continue baking. Potatoes should be easy to pierce with a fork when done. Preheat Oven to 375˚ F and butter a 9 x 13 glass baking dish. 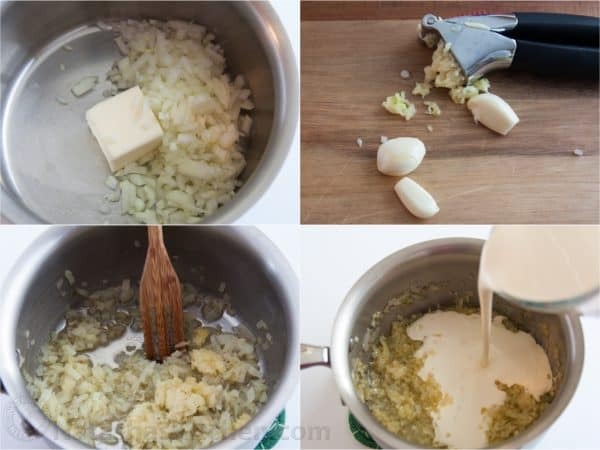 Sautee 4 tbsp butter with 1/2 medium chopped onion in a medium saucepan about 5 minutes or until onions are soft. Add pressed garlic and stir an additional 1 minute. Stir in 2 cups heavy whipping cream and 1 cup whole milk. Heat to a simmer then pour over potatoes once they are in the baking dish. Drain potatoes and pat dry with paper towels. Layer half of the potatoes into the baking dish. Combine the salt and pepper and sprinkle half of the salt and pepper mixture on top of the potatoes. 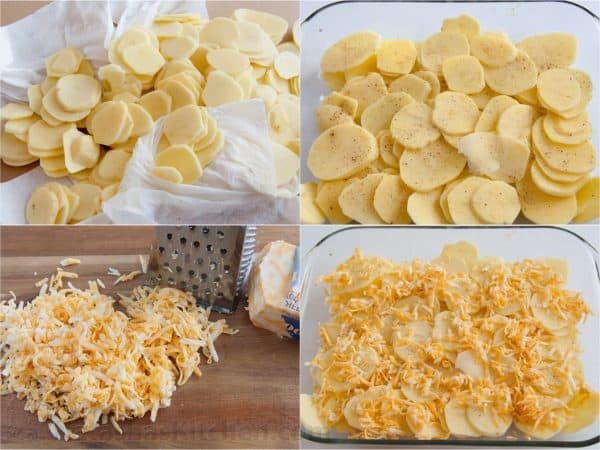 Sprinkle 1.5 cups of cheese on top of the potatoes. Repeat with the the other half of the potatoes, salt and pepper and cheese. 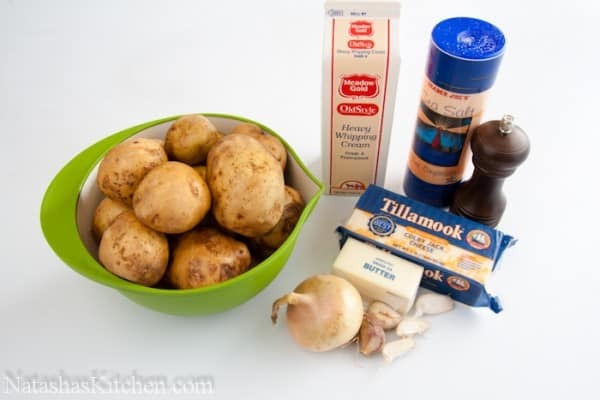 Pour the cream over the potatoes and push the potatoes down to submerge them into the cream. They won't be fully covered by cream and that's OK. Cover dish with foil and bake on the middle rack of the oven for 1 hour. Then remove foil and bake for another 30-45 minutes until top is golden and bubbly and most of the liquid has been absorbed by the potatoes. If the potatoes are browning too fast, tent dish with foil and continue baking. Potatoes should be easy to pierce with a fork when done. Hi Natasha, i love your skinny scalloped potatoes. 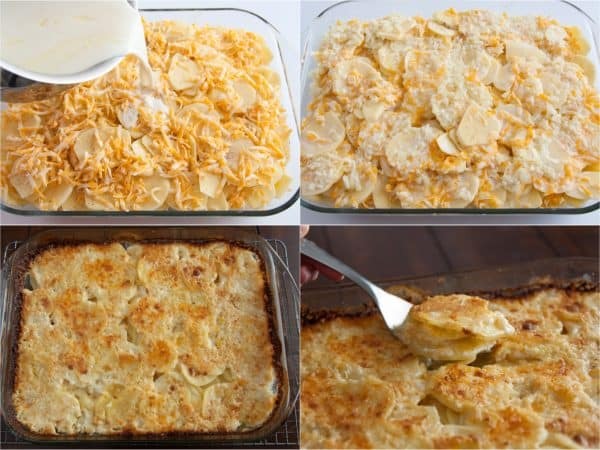 I haven’t tried this version of the scalloped potatoes, so just wanted to get your honest opinion. Which do you like more, which tastes best? skinny or this original full fat version? I made these today. They turned out pretty good, I was happy. Will definitely make it again! A few things: I live in Canada and we do not seem to have Colby cheese. So instead, I did a mixture of Monterey Jack and marble cheese. I find that I was really looking for a sharp cheddar cheese flavour in the potatoes so I am going to try that next time. 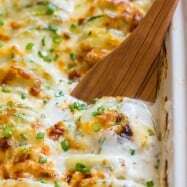 Has anyone else tried this recipe with sharp cheddar cheese? I am thinking I will do a mix of different cheeses again, and include the sharp cheddar cheese as one. I also accidentally bought table cream (18%) versus heavy whipping cream (35%) so that’s what I used. I did not use whole milk, I used 2%. It all turned out good. I do wonder how it would turn out with heavy whipping cream! If the flavour would be even better. These were excellent! I’ve never made scalloped potatoes before and was worried that they might still be quite firm after baking, boy was I wrong! The step by step photos are something I love about your site, it really helps when tackling something new. I’ll never use another recipe other than this one, these are perfect! Natasha, if I only want to make with half of the ingridients to make a smaller portion, do I still keep it for 1 hour in the oven or do I reduce time as well? Prepped and now putting it in the oven. I’ll post later with the results. Today was my first time trying this recipe and I loved it!!! It turned out really good and everyone enjoyed it:) I am new to your blog and wanted to let you know that I love the layout of your website, it is very easily read. So far the recipes I have tried, I really enjoyed. Thank you so much for taking the time to share this with us! This dish looks yummy! definitely on my list of new recipes to try. Any recommendations on what to serve it with meat wise? Also, can you use milk instead of cream, or do half & half? I love my Kitchenaid, I use it for bread dough, pasta. This recipe looks scrumptious. 🙂 Can’t wait to try it. 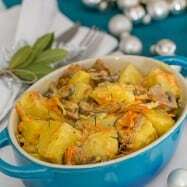 Would other types of potatoes, such as russet, work as well? I have a couple of favorites: First and foremost the potato peeler. I don’t think I would ever cook potatoes if I had to always peel them with a knife. Speaking of knives, I’m currently enjoying Rada Cutlery knives. I got a set on Amazon for like $35 but they are really really sharp, plus they are made in USA so thats kinda nice. my fav kitchen tool is my kitchenaid mixer!!! I do EVERYTHING with this amazing machine! KITCHEN GADGET/TOOL THAT I MUST HAVE IS THE “Zyliss Easy Slice Mandolin” AND I WILL DEF. TRY TO ACCOMPLISH THIS RECEPIE TO PERFECTION WITH PRECISE POTATO SIZING/SLICING! NATASHA YOUR RECIPES ARE MY WORLDS BEST! SO EASY!! SO FAST!! p.s for some reason i cant share or tweet about this. i only see the pin it button but not the other ones?? Am i the only one having this problem?